A criminal organization has overtaken the city. They rule the streets with an iron fist and face zero consequences. The organization’s leader Brock (Peter Whittaker) has powerful allies that have rendered the police neutered. They seem unstoppable until a masked vigilante appears. He roams the streets looking for members of the criminal element so he can deliver to them a savage, brutal dose of justice. No one knows who he is, or how he can be stopped. 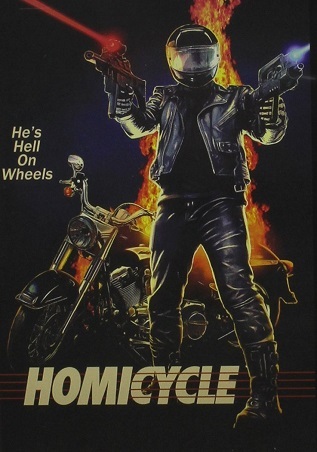 Homicycle is the new film from the prolific low-budget director Brett Kelly. 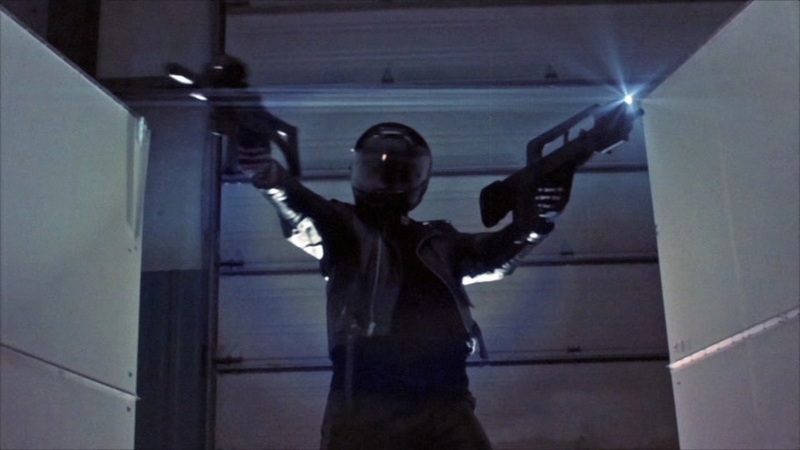 Right away it is easy to see Kelly is attempting to create an homage to late-70s, early-80s exploitation films like The Exterminator and Nail Gun Massacre. 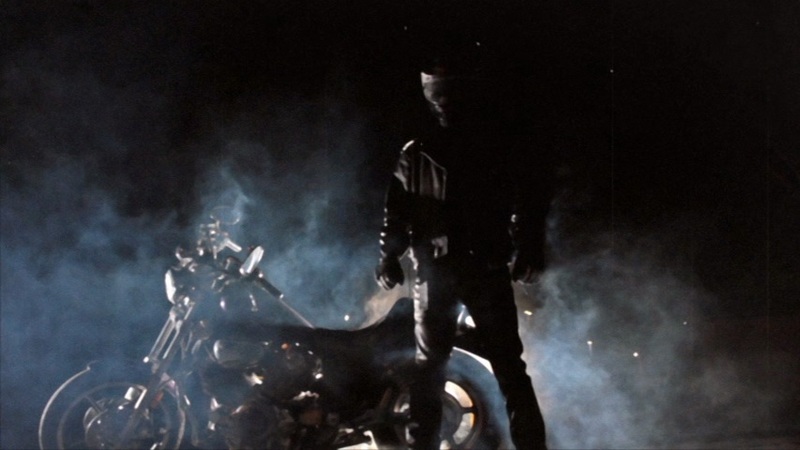 The image has the scratchy imperfection of an improperly handled print, the icy, synth score coolly evokes the time period, and the hero, decked in black leather and a motorcycle helmet, is reminiscent to those who populated numerous exploitation films of the era. While these elements have been combined countless times to entertaining effect in the past, in Kelly’s hands they fall flat. There are various reasons why Homicycle falters, but one of the key issues is the self-aware, tongue-in-cheek way the filmmakers treat the material. I have always felt the naïve charm present in many exploitation films is why there were so memorable and fun. The filmmakers of the past’s determination to give their films dramatic weight went a long way in helping draw the audience into the story, despite any technical or storytelling defects. It is hard to care and become involved with a story when the filmmakers act like everything is joke. This becomes an even greater problem when the jokes are not funny. Another key problem facing the film is the lack of story. Kelly seemed to go into production of Homicycle with just a general concept and some gags, nothing else. Characters and relationships are ill defined and the film plays out like a series of set pieces. While the film has three primary characters, the vigilante, a cop named Julia (Candice Lidstone), and the crime boss Brock, it is easy to see Kelly’s main attention was focused on one character to the detriment of the film. Brock is without a doubt the most developed character, in that he had more than just a name. He dresses like a pirate and has a fetish involving women play games like Parcheesi. These traits are only developed on a surface level. It is never explained why he dresses like he does or what his fetish may mean nor is it discussed how a such a silly, goofy man became a crime boss of his stature. I can only assume Kelly and his team thought these traits would make for a funny joke. They were wrong. The pacing of Homicycle is also completely off. The film’s runtime is only 70 minutes, however the actual “meat” of the film is more around 50 or so minutes. 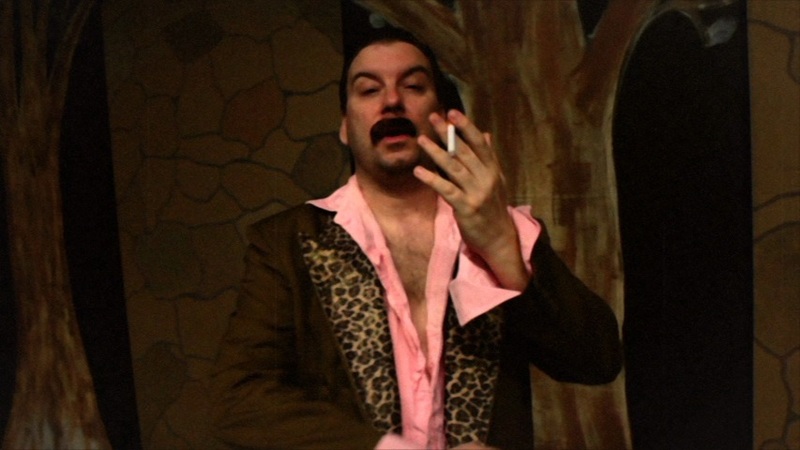 During the film the audience is treated to an introduction with the film’s sleazy “producer”, repeated scenes, a performance by a heavy metal band, a bikini contest, and a lengthy intermission featuring ads for concession food. While these moments are included to bring the film to feature length, they also destroy the pacing of the film. The film never is able to build to any sort of drama or excitement because it keeps getting interrupted by elements which have nothing to do with the overall film. Kelly would have served his film better by releasing it as a short subject. Homicycle probably would have worked better at about 30 minutes in length and never would have worn out its welcome. The most disappointing aspect of Homicycle for me was the film was not complete waste. In fact, Kelly’s visuals were quite strong. He created numerous shots which evoked the time period amazingly well. There were several back-lit, fog enshrouded shots of the vigilante which would not have looked out of place in a film from the early-80s. While Kelly is obviously not on the level of many of the exploitation-era directors as a visual storyteller he clearly has the chops to effectively mimic their style. 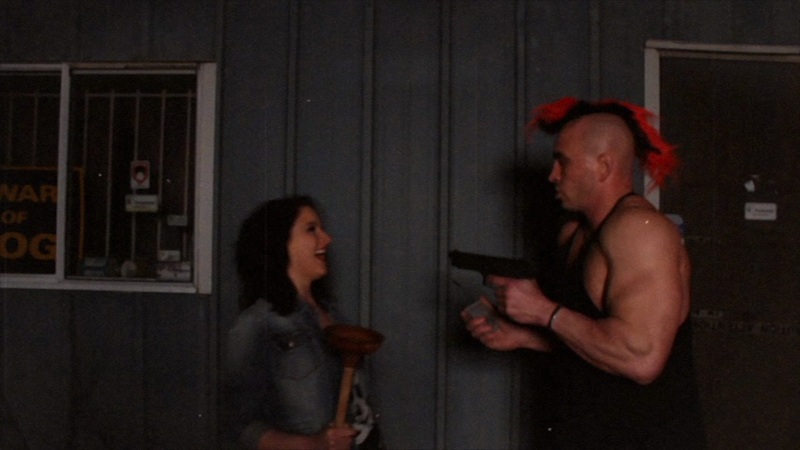 Kelly utilized a grain filter on his digital image which looks pretty authentic and does a good job creating the atmosphere of exploitation films. The atmosphere is further enhanced by a strong synth-based score. Again, the film’s strong elements further highlight the problems of Homicycle. Kelly could have made a far better film than he had with a better script and more serious tone. Bloody Earth Films released Homicycle to video featuring a 16X9 enhanced 1.78:1 image. The picture quality is a fine representation of what the director was going for with the film. 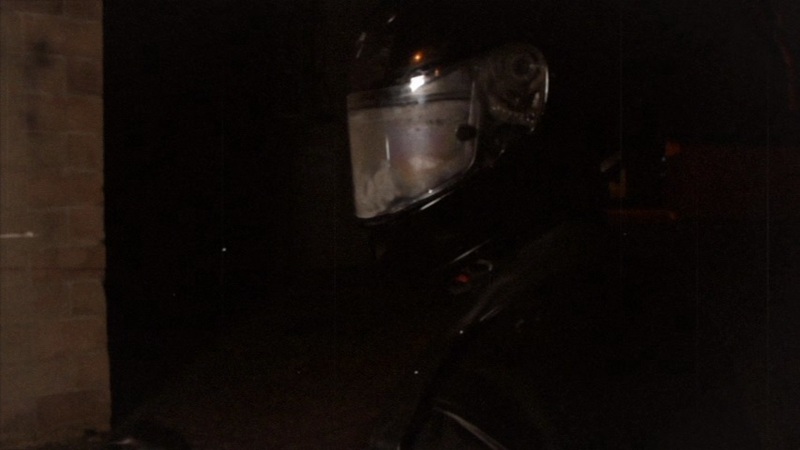 Homicycle has a deliberate rough, damaged look with constant dirt and debris all over the image. 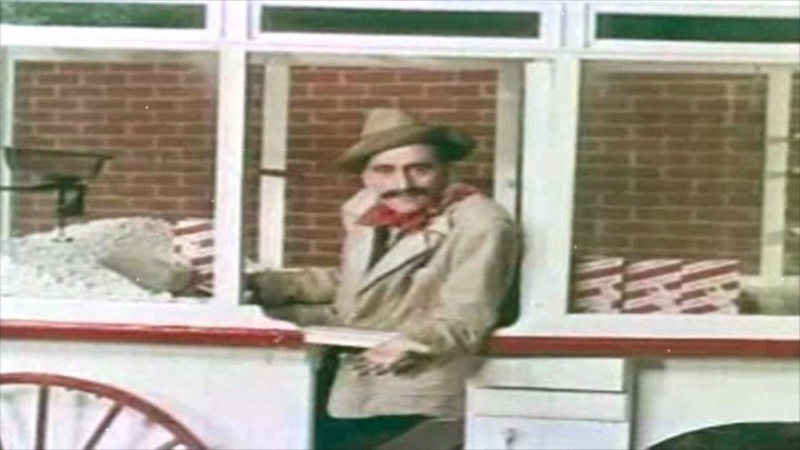 This gives the film a unique look which works in Homicycle’s favor. The audio on the release is 2.0 stereo and works well. The music is really well done and sounds very nice. The dialogue is evenly mixed and is never obscured by the sound effects. The disc does not feature subtitles, but that is not much of a problem. The disc is not packed with extras, although there is a commentary track featuring Kelly. The track features plenty of background on the film’s pre-production and filming. Kelly talks about his influences and has praise for his collaborators. Throughout the track Kelly remarks that exploitation films were bad. This sentiment sums up the faults of Homicycle, Kelly looks at the genre as a joke. While there are plenty of bad exploitation films, many films within the genre are quite good. Directors like Russ Meyer, Radley Metzger, Jack Hill, and Roger Corman are all examples of exploitation filmmakers and all of them are at the very least strong and respected directors. 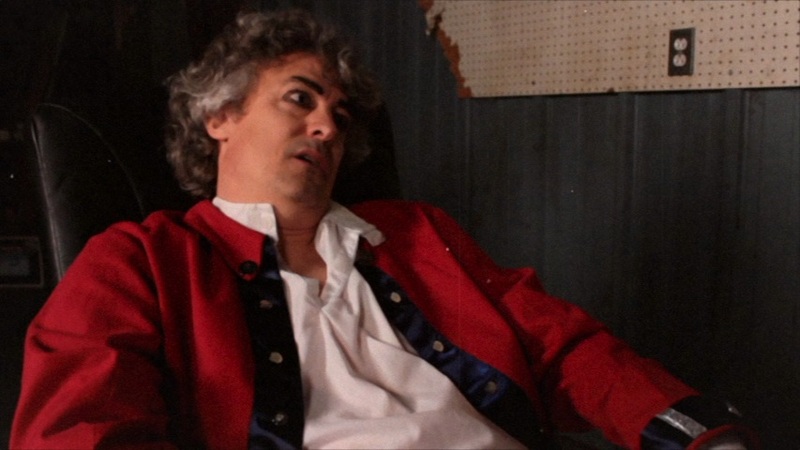 The disc also features a handful of trailers for other low budget horror films. Homicycle is pretty bad. It tries to evoke cinema of another era, it just doesn’t work all that well. I am not sure why someone would choose to watch Homicycle when something The Exterminator is widely available. Do yourself a favor and watch that instead.